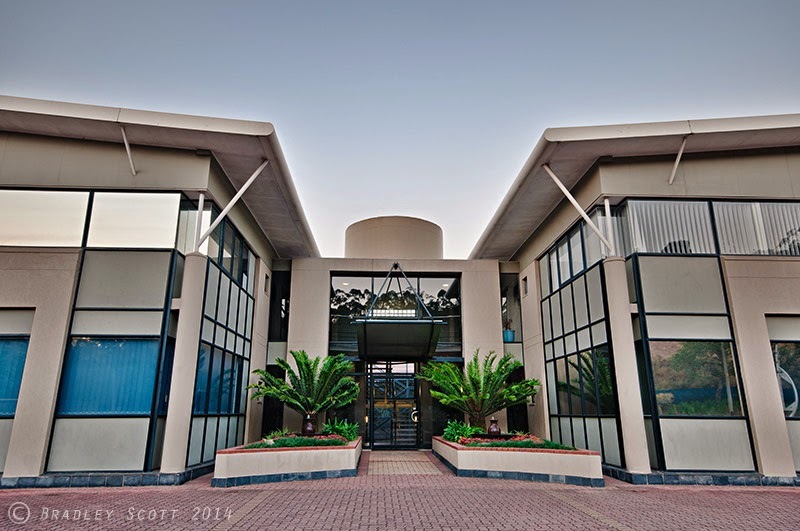 Myself and 5 photographers were granted access to the WestWay office park just on the outskirts of Durban. The architecture is decidedly modern, but without the flourishes of some of the large international office complexes that garner architectural awards. This isn't to say that the buildings are unattractive - many of them are, just that there seems to be an economy of scale in some of the structures. They are, however, all interesting to photograph. What I particularly like is the ongoing greening of the space as a small forest slowly grows around and within the complex. We started at a logistics company in one of the large complexes. Here we had access to a boardroom for the theoretical seminar and the office and reception spaces themselves. Most of the first session was taken up with a theoretical seminar and discussion. What I really enjoyed about this was talking to already knowledgeable photographers. This was very definitely a specialized workshop on a niche genre of photography, and it showed in the seminar and in the questions I was given. A short walk around after the seminar put some ideas on the table. I tried to separate the group after this, giving each photographer a shot that they needed to capture. 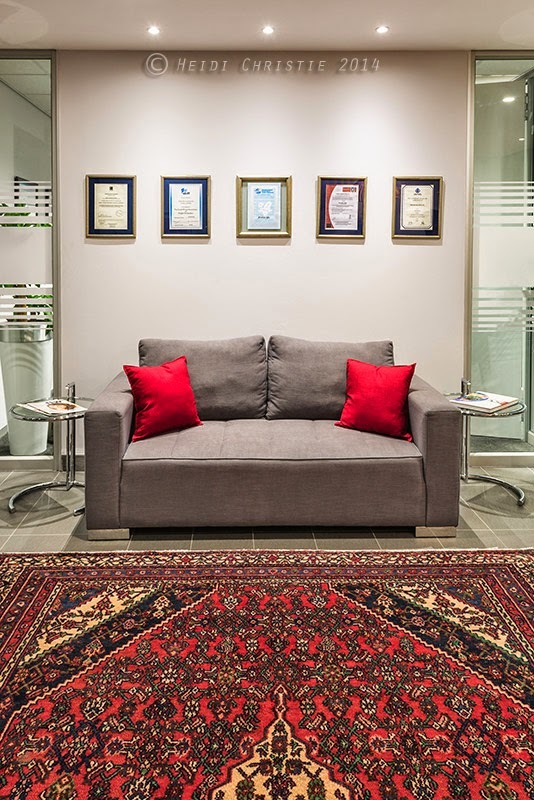 The goal was to produce a set of images that could be used by the holders of the office space that we were using. Standard things would then be office space, reception, boardroom, facade and building setting. Boardroom was out since it was filled with our gear, but we managed to get off some nice images of the office space, reception, kitchen and setting of the office. 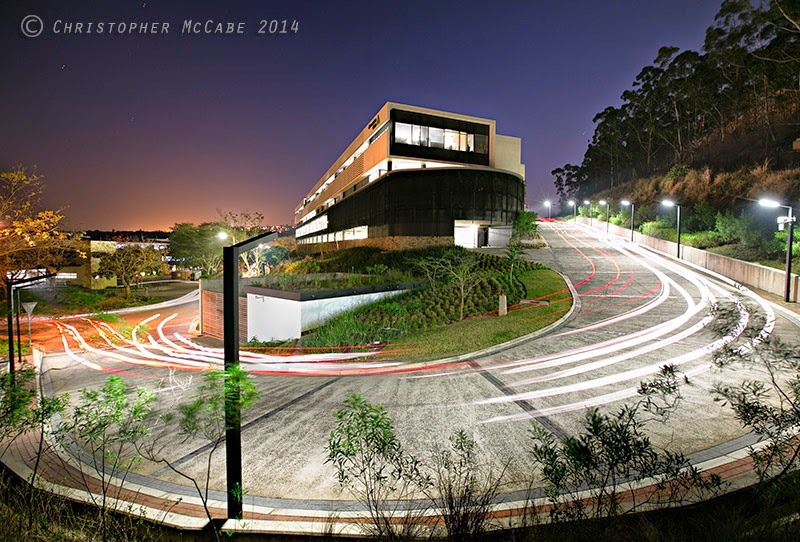 As we entered the blue hour we made a dash down the road to look at shooting vehicle trails in front of the large office unit that we were based in. The following morning we all rejoined at the office park to do a walk to some of the more interesting facades in the office park. Depending on the location, early morning with the sun rising can make for some really fantastic images. However, it's the blue hour just before dawn and twilight that I like the most for architectural photography. The subtle light bouncing off the atmosphere leaves extremely soft shadows if any at all, while the interior lights of buildings make them glow with life, as well as contrast beautifully with the deep blue sky. We didn't exactly get the conditions we wanted, but for the purposes of the workshop I felt that all the the photographers came away with a better understanding of some of the intricacies of architectural photography. All in all, it was an intense and really enjoyable two days of photography. The images here are from the photographers during the course of the two days.